Known for being the national epicentre of fashion, finance and film, Mumbai is the largest city in all of India. And should you want to learn more about the city’s street style but can’t afford a plane ticket to see it yourself, we have a solution. We asked fashion bloggers from Mumbai to break down what women are really wearing. First, we found out that due to the fast-paced nature of the city and its hot, humid climate, Mumbaikars tend to opt for breathable and casual dressing. It’s therefore no surprise that athleisure is one of the biggest trends happening right now. Although Western fashion has influenced style as well, the women we spoke to tell us they prefer to blend traditional Indian dressing with international trends. Bright colours, baggy jeans, and light fabrics are staples in street style, while sneakers or flat sandals are a must for walking around the bustling city. 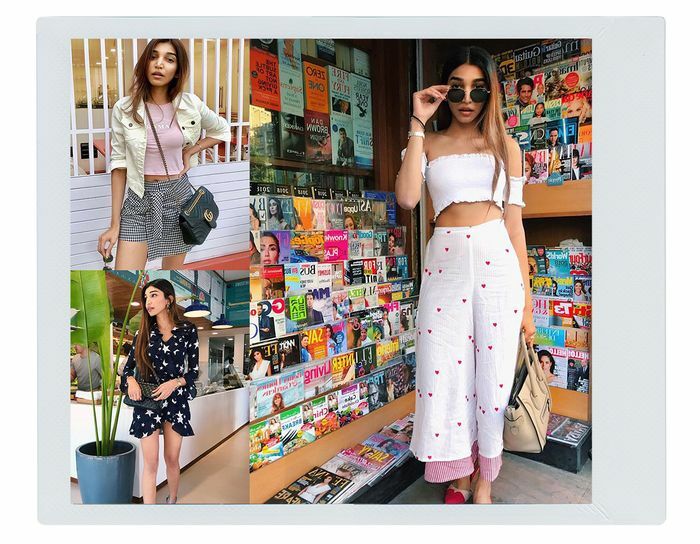 Scroll to learn about Mumbai style from five cool women who call it home; then shop the trends they love. Another big influence in Mumbai street style is social media. “When we see our favourite fashion icon sporting something unique in an Instagram post, it helps us understand how we can put together a particular piece of item or even push us to try a trend we never thought we would,” she shares. Kayaan says her personal style is inspired by fashion films and “anything by Wes Anderson.” As for Mumbai’s overall style, Kayaan tells us that although the city is heavily influenced by the West, it’s ever-changing. “What’s unique about Mumbai’s style is that there’s so much diversity. Art, music and different cultures all influence street style here.” In addition to sustainable fashion, Kayaan tells us that everyone’s still in the sneakerhead phase. As for her own personal style, Sahu calls herself a fashion nomad due to her ever-evolving taste. “I think Instagram has a huge role to play in my style,” she tells us. “With celebrities to bloggers to pretty much everyone sharing their ideas, there’s way too much information to get inspired from.” She also credits Bollywood as being a big influence for her personally, as well as the city she lives in. Available in XS to L.
This post originally appeared on Who What Wear U.S.